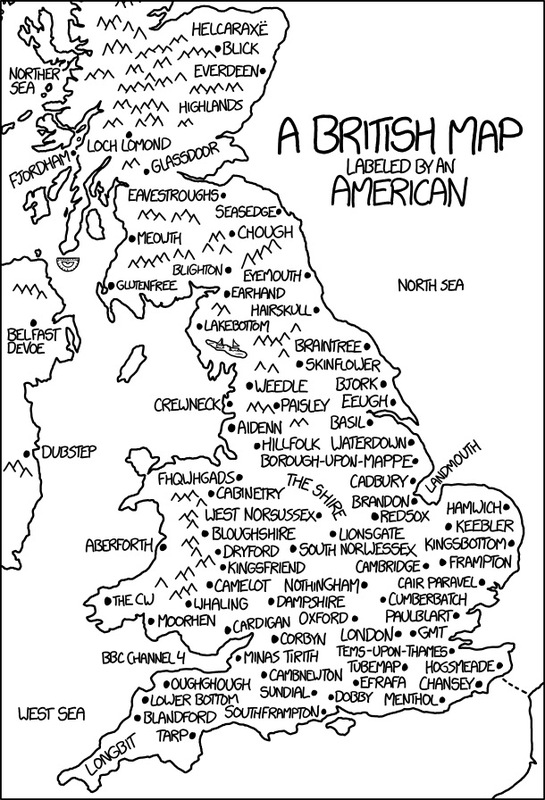 Randall Munroe of xkcd (previously) imagines a map of Great Britain, as if labeled by Americans. Many areas of the UK are most familiar to foreigners thanks to their depiction in various fantasy novels and TV series. This map labels some of these, as well as including many silly names that simply sound like real British towns to an American ear. A protractor is shown off the coast of the Mull of Kintyre in reference to the "Mull of Kintyre test" - the angle of the Mull defines the maximum allowed erectness for a man on British television.